We celebrated Abe's first birthday almost a week after he turned one. 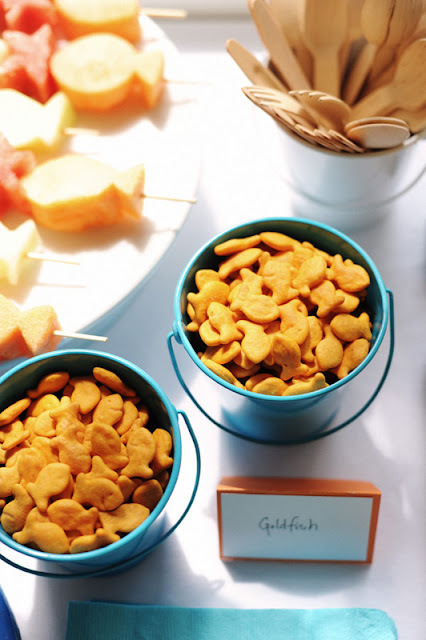 He loves fish (that's one of the animal sounds he can make, and it's sooo cute), so I started gathering inspiration for a fish party a few months ago. Fish in a bag invitation. 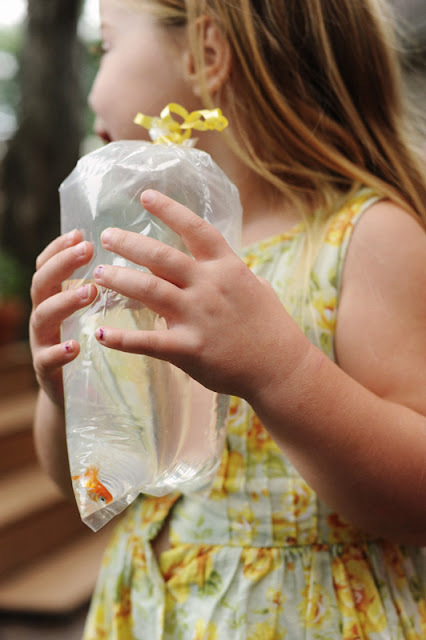 His cousins brought a pet fish as a gift! 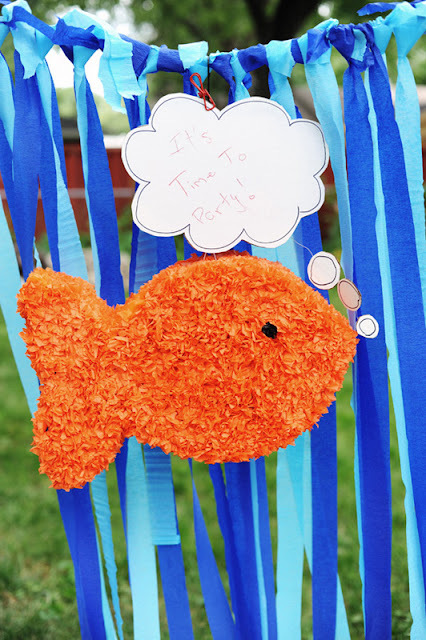 We set up a photo booth with the goldfish piñata I made, and included some speech and thought bubbles for guests to write messages on. The kids mainly used them to interact with the fish! Being diabetic, I generally think in terms of healthy (as apposed to sweet) when it comes to party food. I expanded on the fish theme by incorporating another one of Abe's favorite things - the beach! - to create a lunch menu that was fun and nutritious. And did I mention, it was easy? 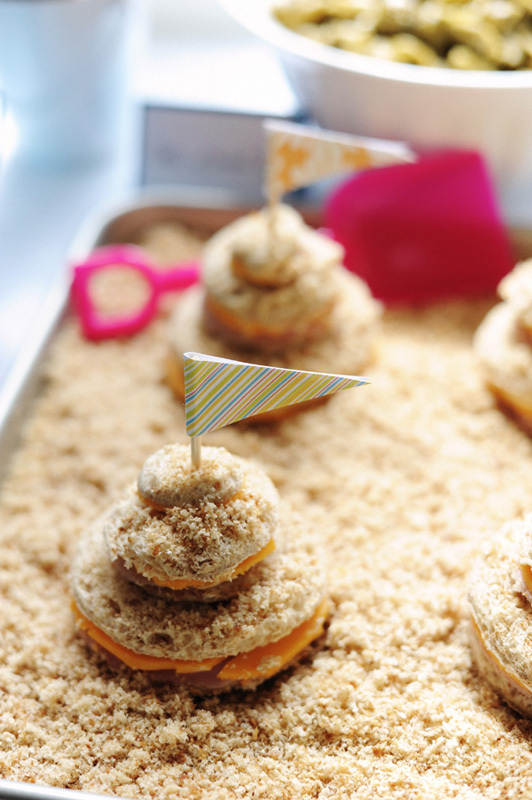 I was able to prep most of the food the day before, so I just had to cut the melons and make the sandcastle sandwiches that morning. My brother came early to help, and made a sub sandwich for the adults while I was taking pictures. 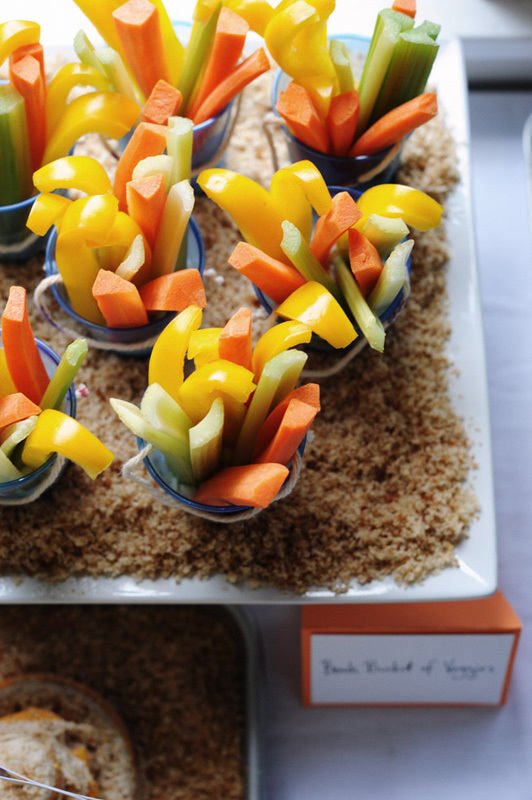 Yellow pepper, carrot, and celery sticks. 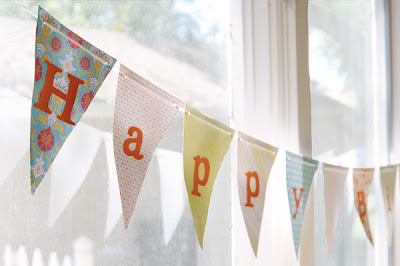 I picked up a this stack of card stock from Joann Fabrics to make the birthday bunting, and used the scraps from the bunting to make sandwich flags and thank you notes for the party favors. 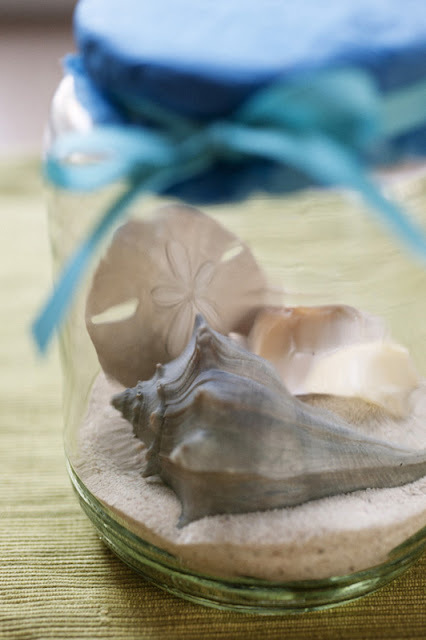 When we got married, my husband and I collected glass cream containers to use for centerpieces. The thick glass bottles were also perfect for serving drinks! I just covered the name of the dairy farm with stickers made from some of the same card stock I used for the bunting, and labelled one for each of our guests. I found the cute polka dot paper straws on Etsy, and made fish ice cubes using trays from Ikea. I kept the table decorations simple with just a couple jars of sand and seashells we've collected on trips to the beach. I decided to do a #1 cake after seeing this sailboat-themed cake. I liked the flags and boats but didn't want to get too far off track, so when I saw these cake toppers I had to try to make one for Abe's cake! I basically followed her directions, but cut the tissue in a fish shape instead of a circle. Luckily I had just enough orange tissue paper left over from making the piñata! Since I didn't have the time to bake a cake from scratch, I picked up a couple boxes of Devil's Food cake mix at the grocery store. For the filling, I used one package of chocolate pudding, but followed the directions to make pie filling instead of regular pudding (reduce the milk to 1 3/4 cups instead of 2). Easiest and yummiest cake filling ever! It was fun watching Abe tear into his birthday cake. 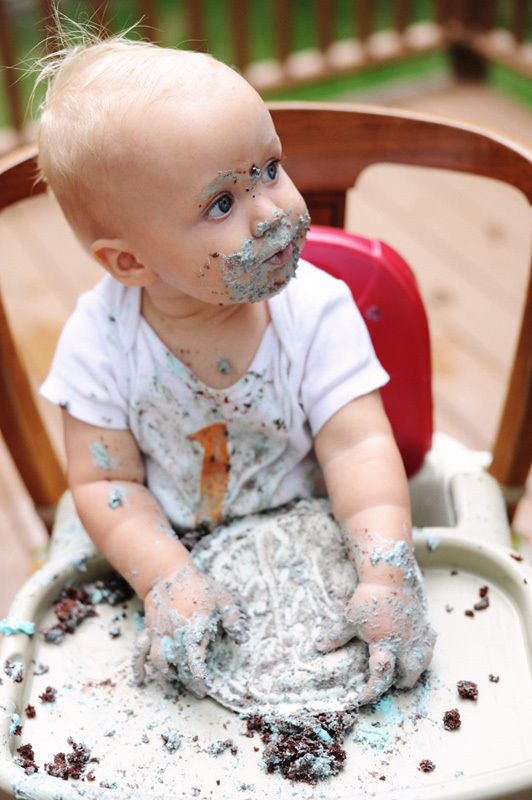 He did eat some of it but mostly just mashed it up and squished the frosting between his fingers. This is his "I'm so excited" scream. I was glad I made his ironed-on #1 shirt from an already stained onesie because I know I will never get those blue frosting stains out! 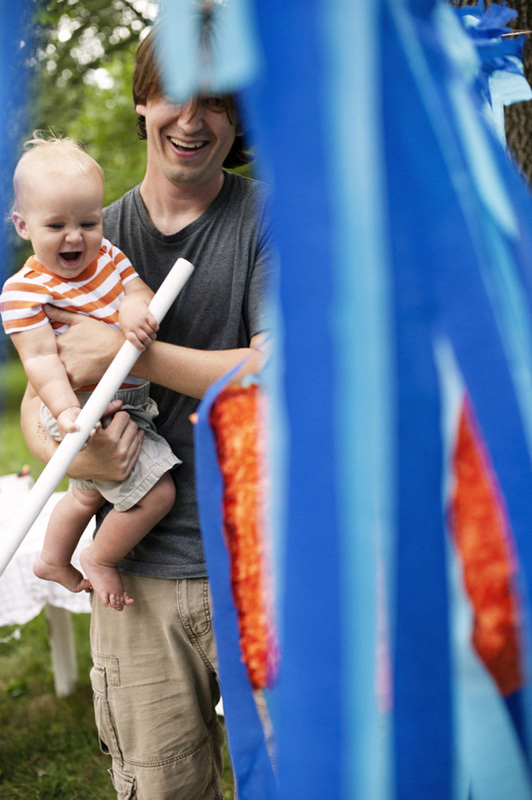 When I saw this post about how to make a number piñata, I was immediately inspired. It looked so easy! No balloons, no papier-mâché - just cardboard, tape, and crêpe paper. Probably something I should have started more than a week before the party, but with a long drive up north and back, followed by a few days with a sick baby who spent a lot of time sleeping, I somehow managed to finish it in time for the party! I was a little afraid Abe might get freaked out to see his cousins whacking the goldfish with a stick, but they gave him the first swing and he thoroughly enjoyed it. Happy with his little pile of loot. 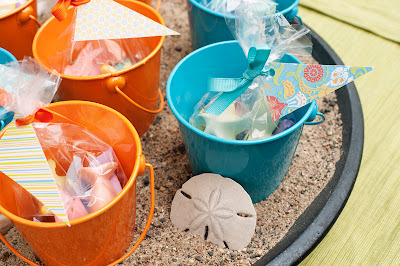 For the party favors, I found these metal pails in the dollar bin at Target (in just the right colors too), and filled them with homemade sidewalk chalk and a thank you note from Abe. I wasn't sure if Abe was really old enough to appreciate a party all for him, but he really seemed to enjoy it, so I'm glad we put a little time and effort into making his day really special. That is a BEAUTIFULLY done 1st Birthday! Gorgeous! 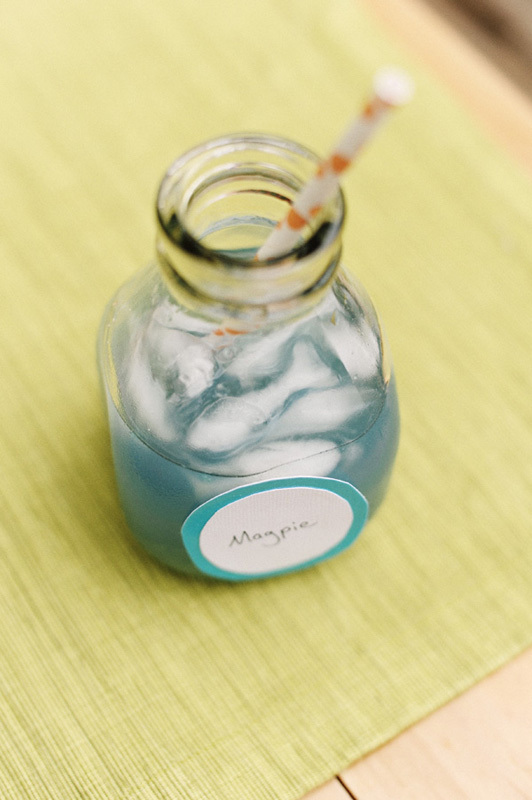 Where did you find the blue water lemonade recipe? I have little boy baby shower this Wed. was searching on Pinterest and found that! Wondering if you have a recipe! Thanks! Amazing! Where did you get the buckets for the veggies? I found tiny plastic Solo cups (same size as Dixie cups) at Target, and used a yarn needle to poke holes in the sides for the handle. I made the handle from cotton twine. The kids loved them! you are SO creative! 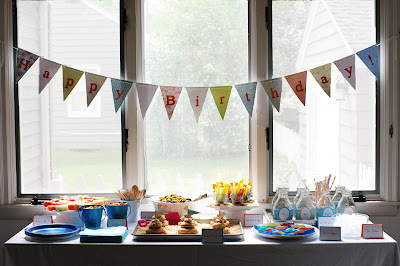 this is such a great party! how about that super cute #1 cake? Did you have a #1 cake pan or did you just cut it out of a rectangular shaped cake? Was the pudding the middle of two cakes stacked? I made two 9x13 cakes, stacked them with a pudding layer in the middle, cut the cake down the middle, and made the #1 from the cut pieces. It was a HUGE cake! 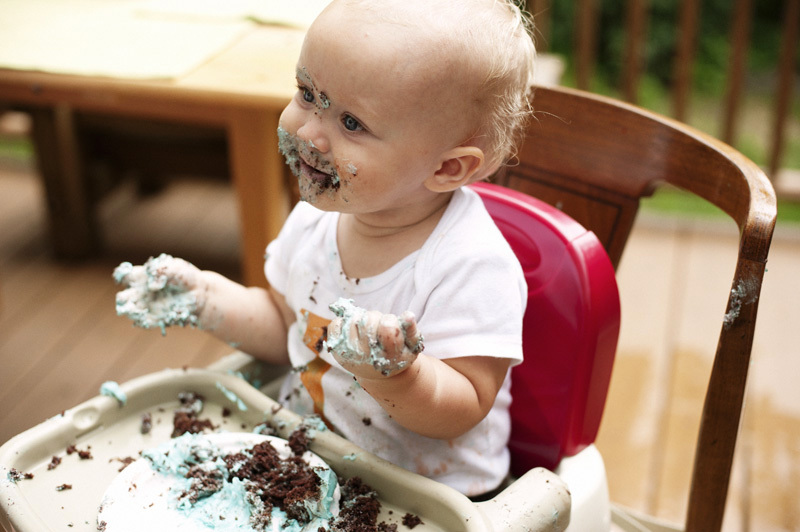 If I did it again, I think I'd only use one cake. 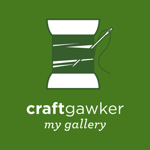 Your blog is so cute and I love this post. 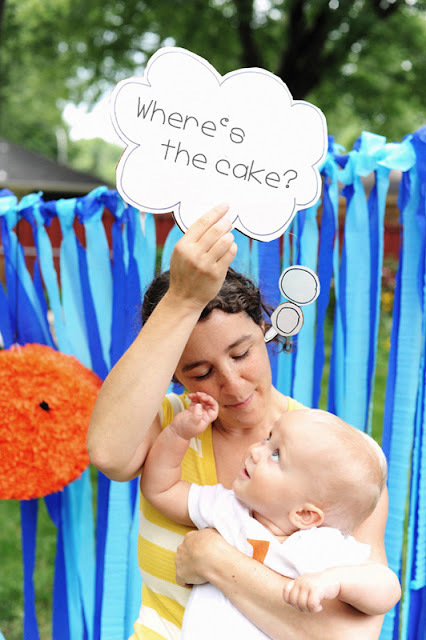 My baby is 6 months old and I am already daydreaming about ideas for his first birthday party. 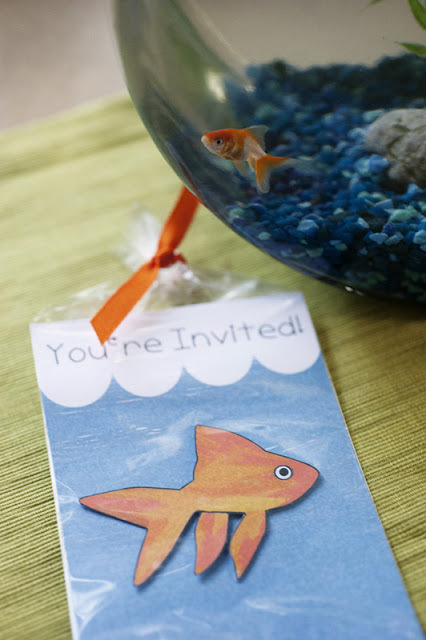 After reading this, how could I not want to do a fish party? Thanks for the great ideas! 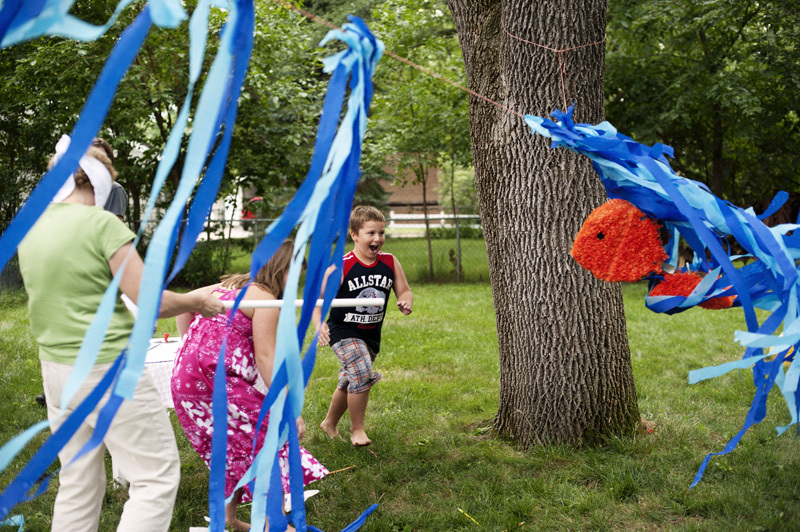 Love your pinata - any pointers or tips on making that beauty!? 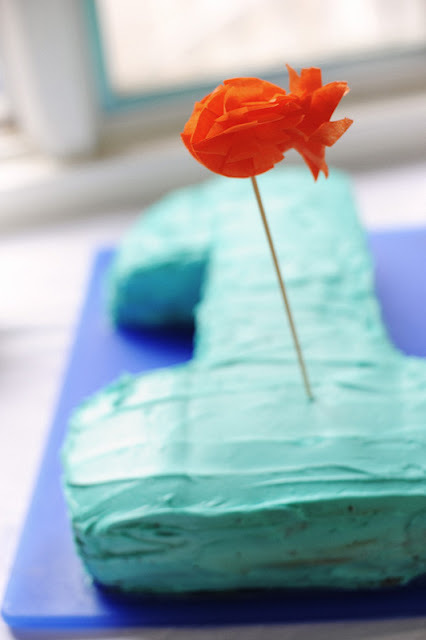 My 7 year old has requested a fish party this year & for us it's just not a party without an pinata, but I have only ever made one - and it was a rectangle Perry the Platypus, so it was super easy! Thanks. 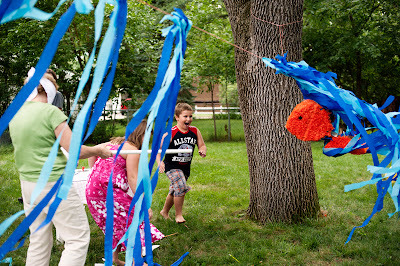 Oh yes, I posted a whole pinata making tutorial right here: http://rustsunshine.blogspot.com/2011/09/how-to-make-goldfish-pinata.html. hey! I cannot access the link to the Pinata anymore. Its gorgeous and I was hoping to replicate it for my son's birthday. Any instructions please? The link is still active but if you can't get it to work try clicking on the "holidays" tab at the top of the page. It's listed under May and August. Or just do a search for "pinata" using the search bar at the top on the right side. It should pop up. Do you still have the recipe for the pasta shells with "seaweed" pesto?